A great smelling house and you get to feel great about it too! "Kiss-Air Candles has announced the launch of Pink Roses, a limited edition candle to support the Addenbrooke's Breast Cancer Appeal throughout October. Pink Roses combines fragrance and essential oils, blending floral notes including lilac, gardenia, carnation and hyacinth with a strong bouquet of roses. £1.50 of each candle sold will be donated to the charity." If you like lipstick or the brand DHC you may want to jot down a 1st of August reminder! "Japanese beauty brand DHC has announced the launch of Premium Lipstick GE, a collection of six age-defying lipsticks. Premium Lipstick GE uses Pure Colour Technology with micronised pigments to deflect light, creating a plumping 3D lip effect. Key ingredients include macadamia nut, olive and rice oil to moisturise; collagen and sodium hyaluronate to lock in moisture; and vitamin A and geranium to protect and condition. With a smooth formula, the product provides full coverage with a hint of sheen, available in shades: Petal Pink, First Blush, Rich Raspberry, Velvety Red, Rose Gold and Bold Persimmon. ! Lots and lots of new Body Shop launches all of which go in-store this Wednesday. Once I get back from London I will be rushing to my local store and stocking up on the new Body Sorbets and Vitamin E Aqua Boost Sorbet . Sorbet? Doesn't that just sound divine. " Firstly we have the launch of Fijian Water Lotus, a new bath, body and fragrance collection. The fragrance comprises top notes of mandarin and litsea, heart notes of Fijian Water Lotus flower and rose, while a marine accord is at the base. In addition, the brand has announced the launch of Vitamin E Aqua Boost Sorbet and Body Sorbets. Vitamin E Aqua Boost Sorbet is a new cooling skincare treatment to boost and hydrate the skin, containing microscopic moisture spheres that act like small reservoirs and hold hundreds of times their weight in pure water. Key ingredients include mineral particles to help absorb oil and mattify the skin, as well as wheatgerm oil, shea butter and soya oil. The Body Sorbets, in Strawberry, Mango, Peach and Satsuma, deliver a burst of moisture without the sticky feeling and contain 100% organic Community Fair Trade aloe vera." Calling all skin care junkies! "Skin Repair has announced the launch of The Oncology Kit, a collection of skin repairing products specifically for symptoms associated with active and remissive cancer treatment. Just in time for Breast Cancer Awareness month, Skin Repair is hoping to raise awareness of the benefit of emulsifier and preservative free skincare on cancer patients skin. Active cancer treatment and recent recovery can cause a number of skin changes including extreme dryness and dehydration, inflammation and irritation all coerced by the breakdown of the skin barrier. The kit contains three essential skincare products to repair, strengthen and support the skin, including: Cleanse Me, Soothe Me and Moisturise Me." This is set for launch this coming October. If you like clean scents this will be your idea of heaven! 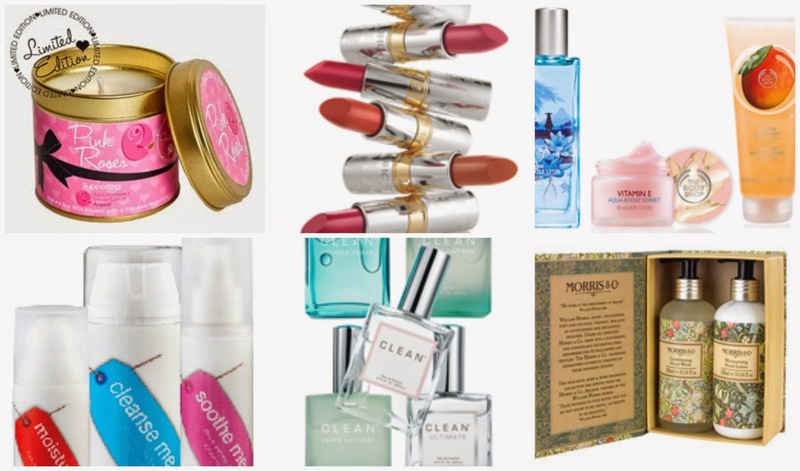 "BeautyBay.com has introduced the new and exclusive launch of beauty brand CLEAN. Heralding from the USA, the brand offers a collection of fragrance, bath and body products, delivering scents which evoke instant recognition of familiar memories. CLEAN offers high performance perfumes and lotions that contain simple formulas that are free from sulphates, dyes and hypoallergenic. Fragrances include: Cool Cotton, Warm Cotton, Fresh Laundry, Original and Rain. Available in Eau de Parfum 30ml, Eau de Parfum Roller Balls and bath and shower gels." I really want to try the fragrances, I mean who doesn't like the scent of clean cotton or the rain? Look out for the sweetest bath and body line launching this coming September "Bath, body and home fragrance brand Morris & Co has announced the launch of its Golden Lily Collection. The fresh citrus scent comprises top notes of tangerine and bergamot and heart notes of cinnamon and nutmeg spices, while cedarwood is at the base. Products feature a dense and intricate floral pattern and include: Conditioning Hand Wash & Hand Lotion, Body Lotion & Body Wash, Hand Cream, Guest Soaps, Bath Crystals, Linen & Room Spray, Scented Drawer Liners, Cosmetic Bag and a Scented Sachet." I have really been loving the Body Shop recently. I just took advantage of their 40% off with free shipping deal with grabbed some tea tree oil stuff, and a couple of their bb creams.